As a child, I can remember with excitement as the day’s long car ride was ending and we pulled up in front of our home for the evening – most often a Holiday Inn. This particular success story could only happen in America. The early days of car travel were rough. The last thing a dirty, road-weary traveler wanted to do was trudge through the lobby of a fancy hotel that catered to the railroad passenger – so they often just pulled off to the side of the road and slept under the stars. Later these “auto gypsies” started to become a menace – they would help themselves to crops along the roadways and litter – so some enterprising communities set up “auto parks”, hoping to cash in on the needs of the traveler and centralize them in a place away from the city center. This inevitably led to groups of people who would live “permanently” in these camps, drawn to the freedom the road had to offer. Town councils were then forced to charge a nominal fee to discourage this behavior. Some enterprising farmers handy with an ax figured out they could build simple log cabins and offer better shelter than the canvas cover on the patron’s car. Thousands of “hotel courts” – small shacks, later small houses complete with garages – sprung up all over the country . Often these independent operators would band together in “chains”, hoping to chain the traveler from one court to another as the went along their way. Eventually these individual cabins gave way to long buildings with multiple rooms, which were cheaper to build. The evolution to standardized hotel rooms was on the way. A lot has changed in almost 50 years: a picture from the same spot as the postcard. It was in this environment that Kemmons Wilson made a journey to Washington, DC in 1951. The condition of some of the places he stayed was appalling, so he came back wishing for simple, clean, standardized lodging – rooms that a family knew in advance would have the same layout and meet the same high quality standards no matter where they went. He went home to Memphis, Tennessee and had plans drawn up for just such a prototype hotel. Obviously having just watched a classic Bing Crosby movie, the draftsman scrolled a cursive “Holiday Inn” on the drawing, and without too much debate, an American icon was born. 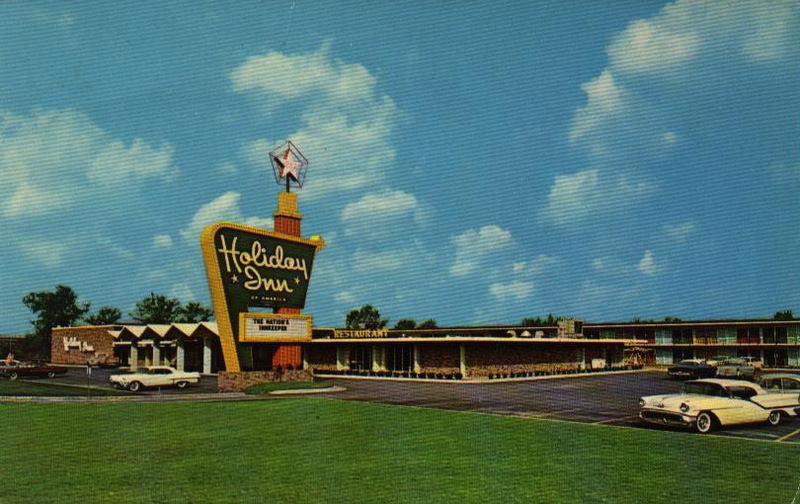 Kemmons’ idea proved pretty popular, because by 1960 there were over 100 Holiday Inns in operation around the country, and by 1970 there were over 175,000 rooms available in the Holiday Inn system. 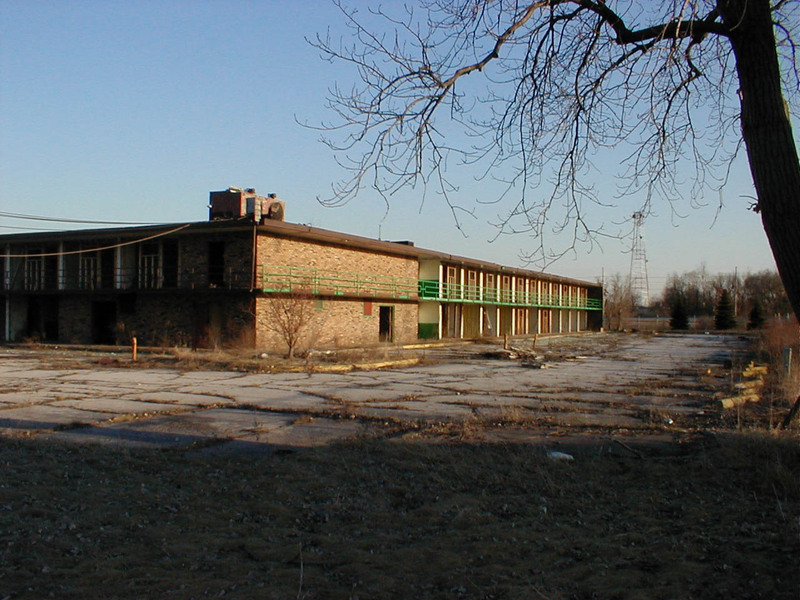 This hotel on the east side of Gary is more than likely one of the locations built during that expansion in the late 1960s – it is true to the standard design of that era. There is a large lobby that also housed a family restaurant – so that the traveler could be sure of what they were eating. Most hotels also had an outdoor pool for family recreation – though in northern climates that pool sometimes was indoors. This facility sits on a very busy stretch of road called the “Dunes Highway” that is also US Highway 12 and 20 between Portage and Gary, Indiana. 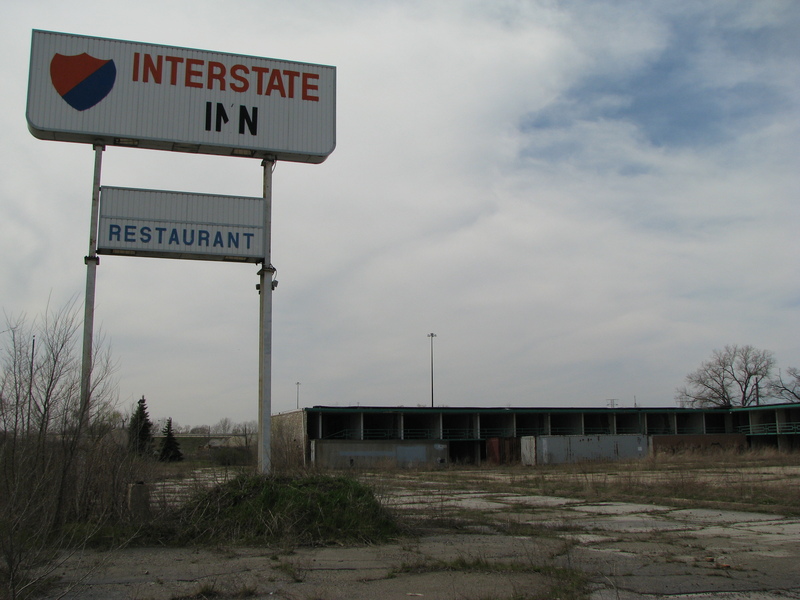 It was once was the major road around the southern tip of Lake Michigan for travelers going from Detroit to Chicago, and even when the state completed the Indiana Toll Road (I-90), literature lists this hotel as “Convenient to the ‘Gary East’ exit from the Indiana Toll Road”. However, when construction finished on I-65, the reconfigured interchange meant that this building was hidden from most traffic, and no clear exit from the freeway would lead you there. That probably spelled eventual doom for the hotel. A large fence surrounds the property, broken down in several places. The guest rooms were in a two-story L-shaped building, with ground-floor rooms opening directly into the parking lot that surrounds the building, and second-floor rooms accessible from an open walkway reached via staircases at each end. The parking lot is overgrown. 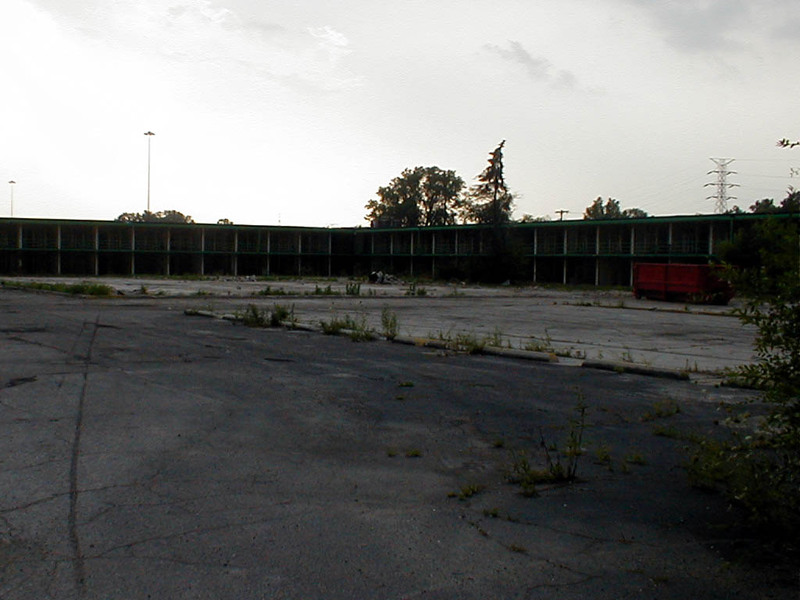 Looking into the former guest rooms from the north side parking lot. All of the metal and glass façade is missing, as are all the furnishings. Most interesting is that all the façade of the guest room section is missing, spare some metal framing on the second floor only and some wood framing on the pool-facing rooms. Carpenters braced this framing in places – especially in the middle of what once framed the doorway to each room. This is also typical design – architects constructed the fronts of each room as a series of panels – some solid, some glass, some door assemblies. There is little glass on the ground in front of these rooms, so in this part of town it is likely that someone removed the front to discourage squatters or homeless, or as part of an ill-fated renovation attempt. It appears as if an equal number of rooms faced out around the parking lot area as faced into the courtyard. Many of these inner-outer sets had pass doors between them to allow guests to open them into “suites”. A guest room, or what is left of it. Because the fronts are missing, you can see directly through the rooms and into what once housed the bathroom for each room. The wallpaper in these rooms is a hideous yellow, white and pea-green striped pattern. All of the carpeting in the guest rooms is gone – stripped to the bare concrete floor. There are no fixtures, mirrors or furniture, save one room on the ground floor that holds a bunch of old dressers that served better as luggage stands than as a place to actually put clothing. 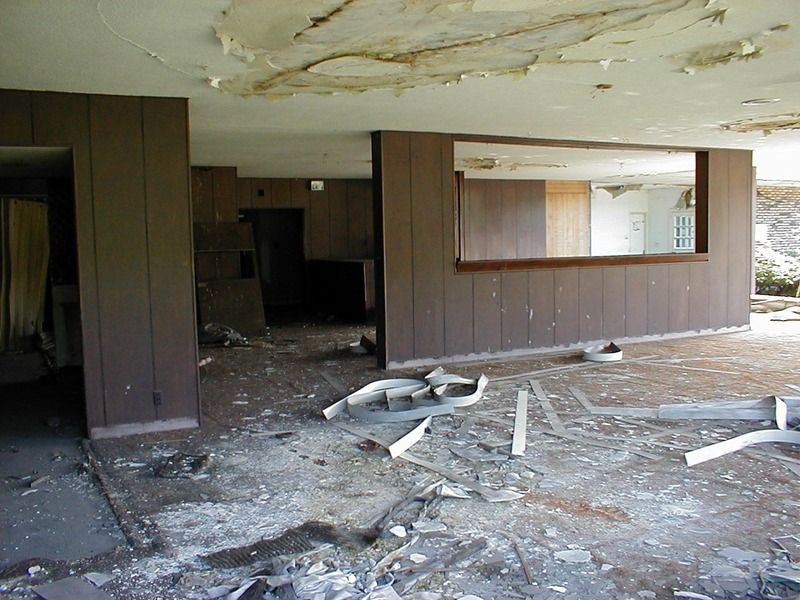 Since it seems someone carefully cleaned out the rooms, it is unlikely that vandals ravaged the property, and much more likely that the owners sold the parts at auction. 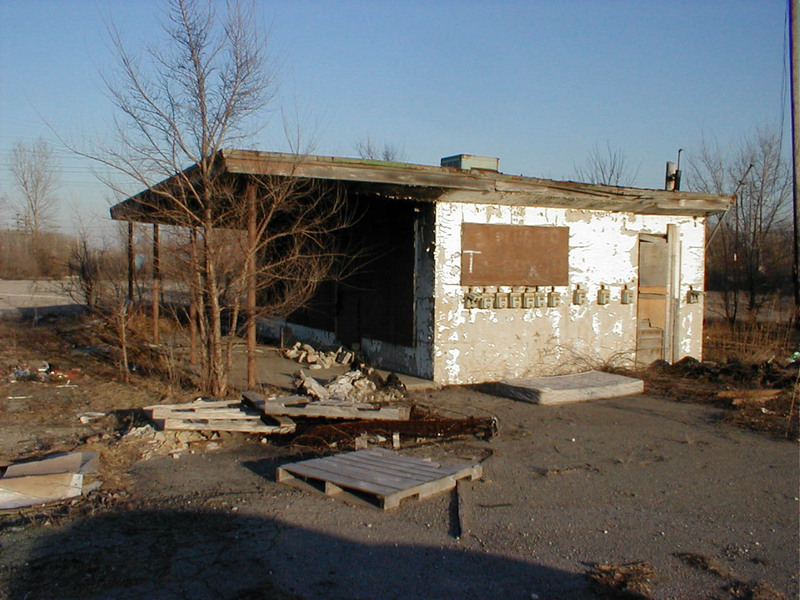 Workers constructed the walls from cinder blocks and the floors from concrete, which is why they have lasted, even exposed to the harsh winters of northern Indiana. 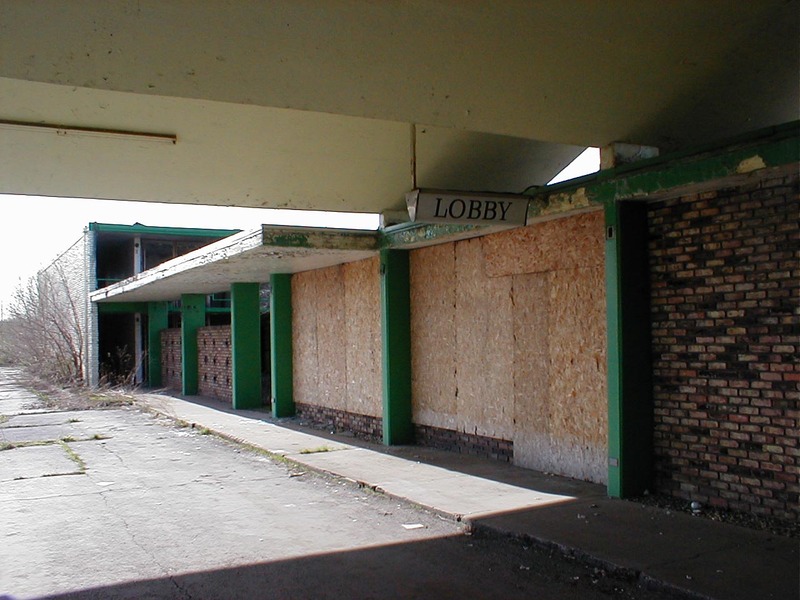 The boarded up lobby entrance. 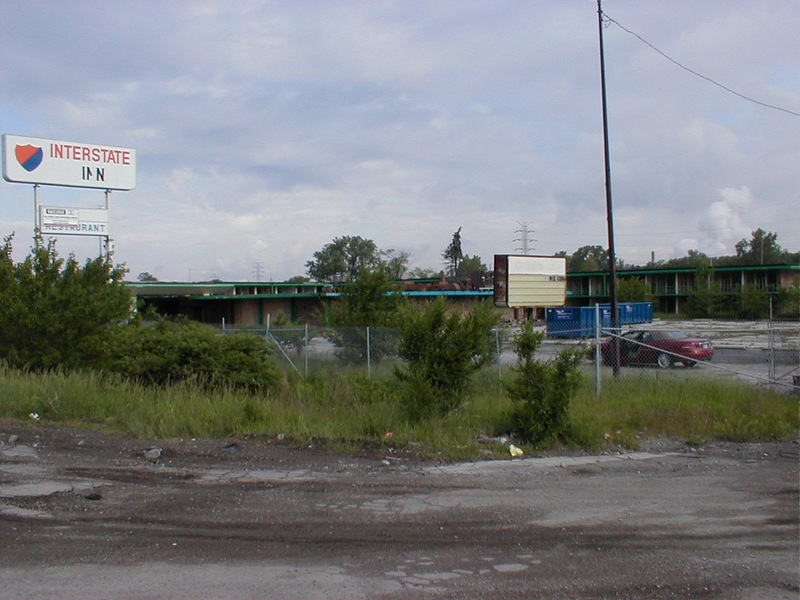 The hotel was most recently called the “Interstate Motor Inn”, and a sign on the site indicates that it was up for auction in 1997 – apparently with little success. A search through the archives of the Gary Post-Tribune shows that this was a frequent trouble spot for the Gary police in the early to middle 1990s, with at least one murder occurring here and a teenager abduction. There are staircases at the ends of the guest room buildings that have wooden walls built up to block access to the second floor back side of the building – no doubt this was the first section to close and management didn’t want people wandering back there. Boards cover the lobby building’s front door and windows – but they are the only ones that are that way – the rest of the glass and doors are missing. There is a large, 1970s era satellite dish out front – no doubt for the free HBO. To the left of the front door is a brick wall that shielded the courtyard from the road in front, and then the end of the L-shaped guest room building begins. The awning over the driveway is a zig-zag shape, and all the trim on the building is still painted Holiday Inn green, spare some odd bright blue trim on the main building. 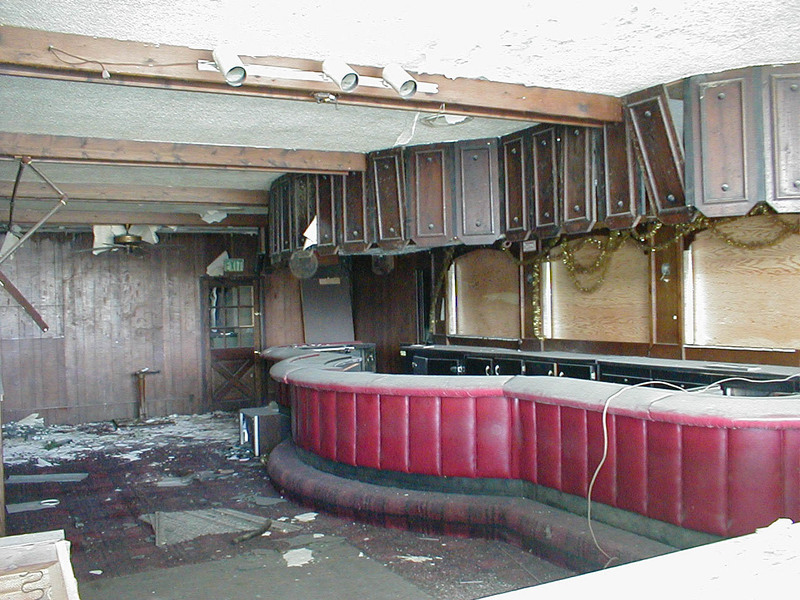 Looking into the former lounge. To the right of the front door, the boards that once covered the windows into the lounge are missing and vandals smashed out the glass. Thus one can stand in the front driveway and take pictures right into this room. Decorators created a typical 1970s style room, with dark wood and some dark overstuffed chairs clustered in the back. The carpet is a tacky red and black plaid pattern, which suggest this might have had a Scottish theme – or just a really bad decorator. There are Christmas garlands still hanging from the bar, though all the liquor is long gone. The room has a door near the bar which opens up into a small hallway, across which is a window into the drink preparation area for the main dining room. To the left of the lounge – between it and the front door – is a hallway that opened up to the front drive, probably though a missing emergency fire door. The hallway runs the length of the building, and you can see the original restaurant in the back. On the left side are some empty storage rooms, and on the right is the lounge. Further down the hall is a small empty room – most likely a meeting room or private dining room, since it is the right size and close to the kitchen. 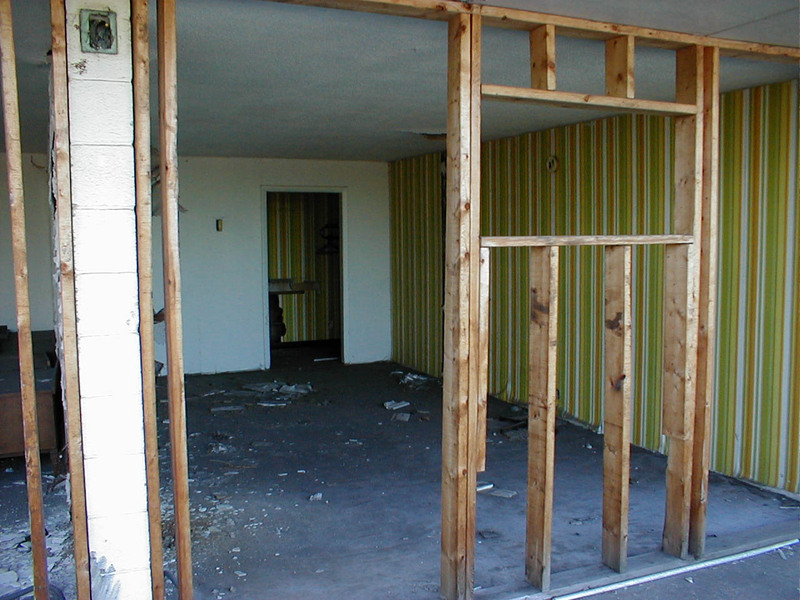 The walls are wood paneling that was later covered by thick wallpaper. Serious water damage appears at the bottom of the walls, since this hall has been open to the elements for some time. Once fully covered in acoustical tiles, the ceiling has lost some, fell and smashed to the floor, most likely when their glue became weak with humidity on a hot summer day. One can imagine guests, perhaps fresh from a wedding reception or family reunion, walking down this hall searching for a drink in the bar or a bite to eat. The restaurant. Cashier in the back, drink preparation area on the left, kitchen on the left (out of picture). Taken while standing in the courtyard though a now missing picture window. I walked around behind the lobby building into the L-shaped courtyard formed between it and the also L-shaped guest room building. Floor to ceiling glass windows once lined a large open room on the back, now smashed to the ground. This large room was the main restaurant – the opening to which was the long hallway that stretched from the front emergency exit. There is a cashier counter by the doorway, and four other openings: to the small private dining room/meeting room, another to an area for preparing drinks, another to a small office-lined hallway, and to the main tiled kitchen. The drink preparation area has a window into the bar with a curtain over it, most likely for retrieving alcoholic beverages while getting around Indiana’s very strict laws about minors not even being able to see a bar before they are 21. The courtyard and swimming pool from the restaurant. The carpeting is still here, red but stained with missing ceiling material and pieces of the vertical blinds which could once close off the giant picture windows. The walls are dark wood paneling. No doubt this was once a very pleasant place to eat, with great views of what was once a neatly trimmed courtyard and a swimming pool filled with kids splashing away the summertime. I can remember eating some “Fish and Chips” (frozen fish sticks and fries) in a room much like this one on a vacation we took to Florida, anxiously awaiting the chance to jump in the pool. 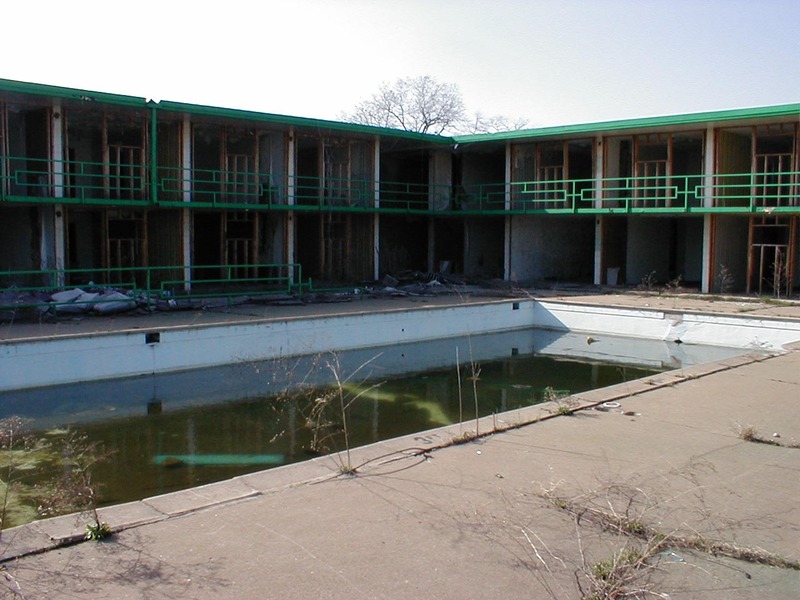 Unfortunately, the pool at this site is probably not fit for swimming, having collected some of the junk from the closed hotel and several seasons of rainwater and melting snow. 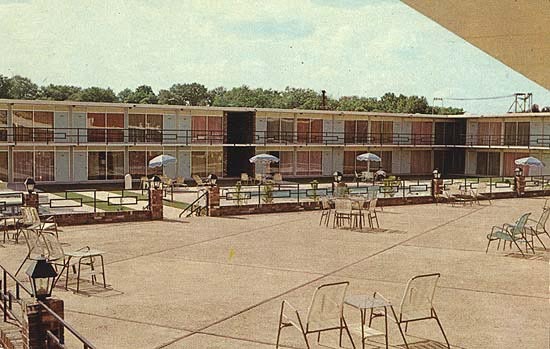 This middle 1960’s postcard image from the Tupelo, MS Holiday Inn indicates what this area might have looked like in its prime. Note the same railings exist on this hotel as the ones in Gary, and the overall hotel follows a similar design, indicating a similar construction time. By the middle 1970s the Holiday Inn chain was in trouble. Intense pressure in the mid-priced hotel market, coupled with the gas shortage that curtailed auto travel, and the once modern hotels were now becoming dated caused the brand to begin to decline. In the middle 1980s the chain underwent a rebirth – jettisoning the old flashy signs for new, sedate ones, and spending millions on refurbishing properties and building new ones. They also launched the Crowne Plaza brand, an upscale offering targeted to business travelers. In 1990, Kemmons Wilson sold Holiday Inns of America to Bass, PLC (the British makers of Bass Ale), who now run it as a unit of Bass Hotels. Simultaneously they launched a new brand , Holiday Inn Express, a low-priced concept targeted at the very same market Kemmons Wilson originally tapped – the interstate traveler. This mysterious building is full of tires. One other note: Immediately to the east of the property is a large, weed-infested parking lot with this mysterious building in the middle. The building could be some sort of office or concession stand, which is now filled with old tires. On the side of the building are a series of power switches. I suspect this was a truck parking lot, with power outlets that once ran out to the various positions throughout the lot. 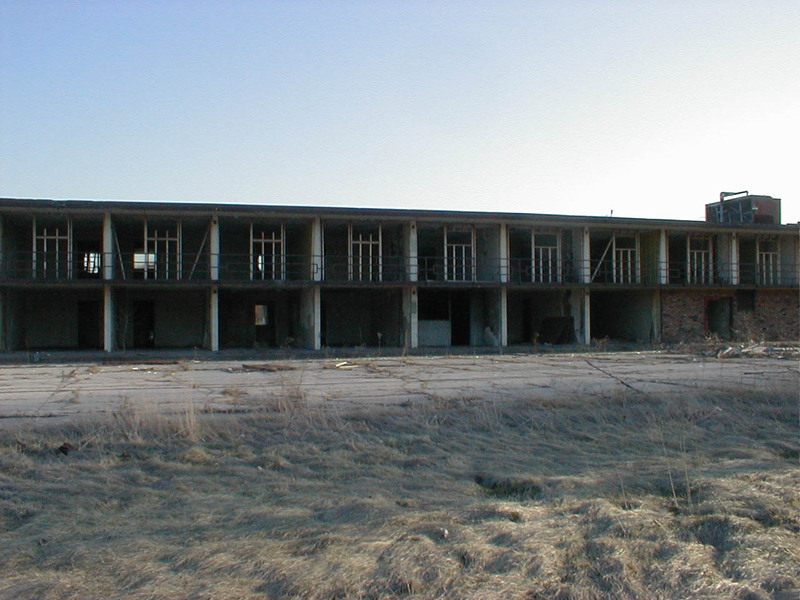 During the summer of 2001 the building was partially torn down. Only the L-shaped room buildings are left – the office/resturant/bar building is gone, and the pool filled with gravel. 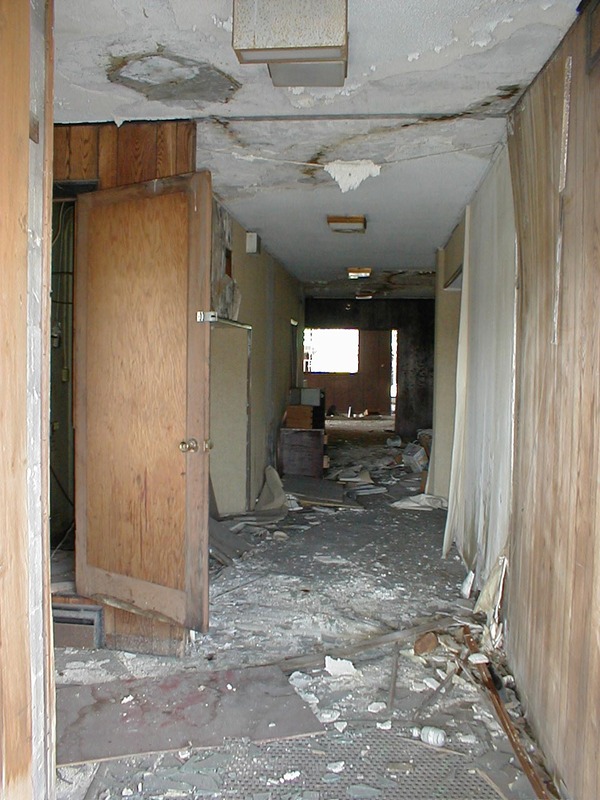 This leaves no location for vagrants to seek shelter (the rooms are open to the elements) or children to be injured, but leaves the possibility for redevelopment. In 2002, Bass spun off it’s remaining beverage businesses and became InterContinental Hotels Group, owner and franchisor of a group of hotel brands including Holiday Inn, Holiday Inn Express, Crowne Plaza, InterContinetal, Candlewood Suites, Staybridge Suites and Hotel Indigo. Kemmons died on February 12, 2003 at the age of 90. In 2007, IDG launched a major rebranding of the Holiday Inn chain. As of April, 2009, the facility still stands, though some (empty) storage containers have now been lined up along the west building wing. And, I was wrong about the vagrants: one had collected some furniture and set up a pretty nice little first-floor apartment in one of the North wing rooms. He was too busy sleeping off the wine to care about my picture taking, though. I’ve read several just right stuff here. Certainly worth bookmarking for revisiting. I wonder how so much attempt you place to make any such magnificent informative website. I know you wrote this story quite some time ago but reading ur story, I was hoping to find something on the recent post I saw. Now I’m not great at adding things with computers so this site might bring you to the strange scene photographed recently. If you can’t find it there, look up the page of Ardesaa Stewart. She has some creepy pictures of dresses hanging in each room. Nobody seems to know exactly why they are there. Some say they know clothes are being sold out of there but others think it may be a way to lure women to that creepy hotel. Thought you might have an opinion.